“People get excited for clubs, but you will not see the excitement you’ll see in us in other clubs,” Abelmann said. With the attention given to the X Games or the longstanding “Tony Hawk’s Pro Skater” video game series, skateboarding is a well known balance sport. But longboarding, its related but lesser known offshoot, is beginning to garner much more attention on college campuses. “Skateboarding is going and doing the tricks, needing to have a skatepark around. All you need is a longboard and some friends and you’re good,” Abelmann said. A longboard is a longer variant of a skateboard, but while skateboards have a fairly standard shape, longboards can have a variety of shapes and sizes. Certain longboards are more conducive to downhill race competitions, allowing for a low center of gravity and better stabilization. Others can be more flexible, allowing for sharp turns and “carves” like you would find on a snowboard. But the most distinct attributes separating skateboarders from longboarders is not in the boards, but in the skaters themselves. For example, riders have developed a specific lexicon for longboarding. There are technical maneuvers such as a Coleman Slide for slowing your board on a hill. “Kind of like in ‘The Matrix.’ You lean back and dodge those bullets, right? It kind of looks like that,” Abelmann said. Longboarders also share slang terms. “Bombing” a hill means riding down at full speed, going straight as opposed to carving in and out. “Wobbles” or “the wobs” is every longboarder’s biggest fear, Abelmann said. If you are going too fast and you begin to lose balance, you will experience the wobs. “Your board will start violently shaking back and forth and if you don’t correct it, it’ll throw you off and you’re getting some nice road rash,” Abelmann said. 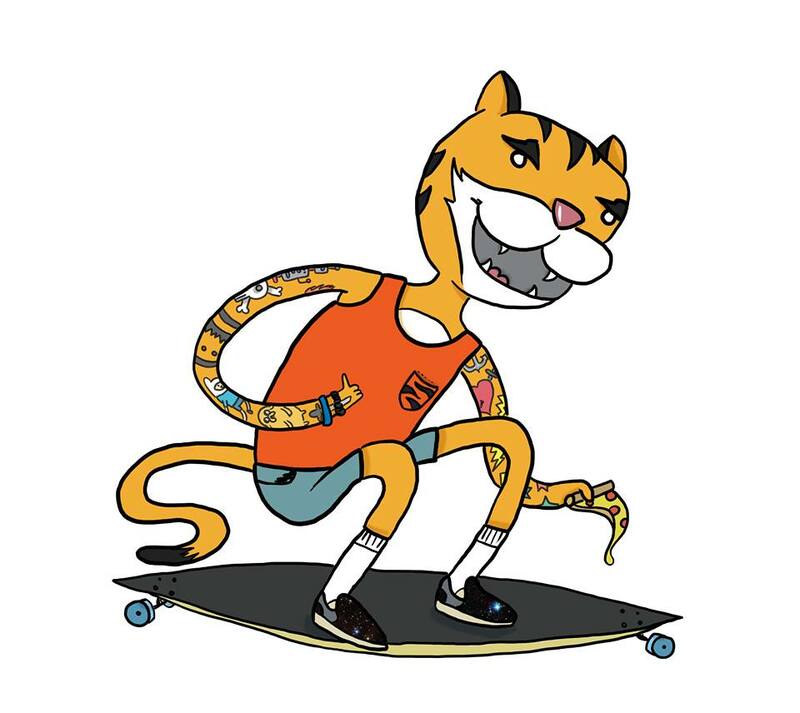 Doug the Tiger, the Glider Alliance mascot. 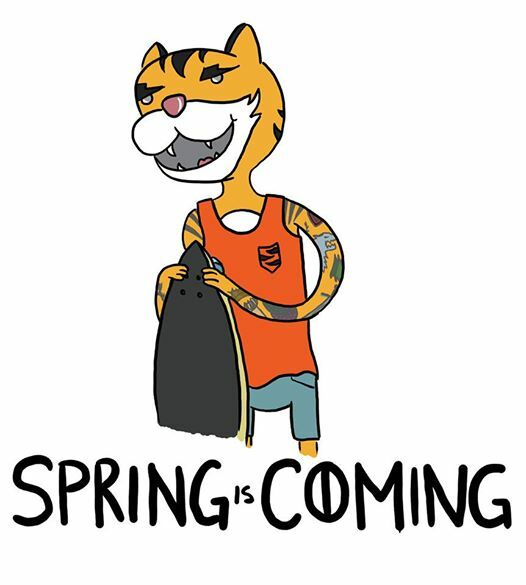 Doug is the younger, rebellious brother of Doc the Tiger, Towson University’s official mascot (Courtesy of Glider Alliance, Logo by Jennie Bukowski). “You shreddy yet?” asks Trenton Meiron, 22, a Glider Alliance member. “Shreddy means you are down. You’ve got your pads and your helmet, your board, your wheels all tightened. You can go,” Meiron said. Meiron did an independent study at Towson dedicated to drawing topographic maps of Baltimore County to find its steepest hills. “The best hill to longboard is a hill you haven’t gone down,” Meiron said. He and his friends always congratulate the person willing to take the dive first. “No matter what we’re always like, dude, you’re crazy for doing that first. We always try to be the one to go down a hill and be like, yeah, I was the first one, you guys were wussies,” Meiron said. However, Meiron said that he wouldn’t divulge the steepest hill in the local area. “It’s on a super sketchy – the pavement is so bad on it. I don’t want people to kill themselves,” Meiron said. A huge factor of the Glider Alliance’s philosophy and Meiron’s own longboarding is rooted in safety. He said that falling was common and that having a bottle of hydrogen peroxide for scrapes is essential. Slalom longboarding, where riders weave in and out of cones, and downhill races are the most common, albeit dangerous, modes of the sport. A typical downhill competition will feature a six-man heat, where the first three to reach the bottom of the hill advance to the next round. Corner marshals monitor the racers for misconduct. Cobian has sponsorships from Rayne Longboards, Abec11 Wheels, Viscous and Holesom. He started longboarding as a hobby and became a professional when sponsors approached him. “I’ve met a lot of people from different countries, and it’s good that you can contact anybody from any part of the world and they always welcome you to stay with them,” Cobian said. Cobian attends Iowa State University where he heads the longboarding club on campus. Iowa’s club was established prior to Cobian joining, but at Towson, the Glider Alliance began in the Spring 2013 semester. “It’s not really a structured thing,” said Ceanne West, 20, co-founder of the Glider Alliance. “It’s more about people hanging out who happen to have a page on Involved at Towson and a room reserved every other week in the Union,” she said. This spring semester will mark the group’s first active marketing push, choosing a word of mouth strategy. (Courtesy of Glider Alliance, Logo by Jennie Bukowski). “The whole idea is that with the warm weather, everyone is going to be out longboarding. You’ll see us,” West said. Abelmann said that he likes to recruit people while riding around campus, going so far as to give on-the-spot lessons. Brooke said that while many street skaters may ride for themselves, longboarders want “to share that stoke.” He compared it to a push versus pull strategy in advertising. Whereas skateboarding tends to push a “commercialized proposition” of getting kids to skate through the media attention, longboarding is more “grassroots” by pulling its riders in. Brooke’s love of longboarding encouraged him to start a movement called Longboarding for Peace. While planning a 2012 trip to the Middle East with his family, Brooke knew that he wanted to do more than the typical tourist. After hearing of an earlier movement called Surfing for Peace, Brooke got a group of organizations together to hold longboarding demonstrations for the Israeli and Palestinian territories. “Kids that would normally be fighting with each other were actually hanging around skateboarding with each other,” Brooke said. The movement has participated in gun buybacks, allowing anonymous donors to trade weapons from off the street for longboards, as well as blood drives. The movement is now active in over 20 countries after having started in Spring 2012. Brooke said that he hopes the movement can bring more joy and happiness to the world, while minimizing the amount of pain and suffering. “And because it doesn’t really have any structure, all it has is this thing called a longboard, you step on a longboard – I ask [longboarders] if they want to step up,” Brooke said. Abelmann said that his goal in coming to college was to make a group of friends for life, which the Glider Alliance has helped to accomplish. “There is no sense of competition when you’re with a bunch of people longboarding,” Abelmann said. “We share that big concrete wave or whatever and we cohabitate very well. It’s a positive way to live. Abelmann paused and then laughed.